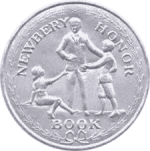 The Newbery Honor Books are runners-up to the Newberry Medal, which is awarded each year for the preceding year’s most distinguished American picture book for children. Learn more: official Newberry Medal and Honor homepage. The story of a fourteen-year-old girl in nineteenth century Albania who rejects an arranged marriage. The Doll family is shipwrecked on a desert island. In second century Rome the daughter of a centurion is raised as a slave. The story of a school outing on the frozen Dutch canals. The adventures of Jancsi and his cousin Kate on his father’s ranch in Hungary. One winter up on Minnesota’s Iron Range, two boys adopt a moose who decides to stay the winter in the livery barn. Two girls from England are on holiday in Bruges, Belgium and meet the littlest orphan, Madeleine. Phebe spends a year with her with her country cousins in Connecticut in the 1840’s. Kay and Garry Ellis spend the winter in an old farm house, and are the better for it. The story of Thankful Curtis, her island home, her time at school and her return. In the fourth volume of her history Laura and the Ingalls family move to Minnesota and live in a dugout on the banks of Plum Creek. When Mr. Popper unexpectedly becomes the proprietor of a troupe of penguins, he takes them on the road to make ends meet. Bill Crawford sets out from New Hampshire with a peddlar’s pack for the Ohio country. Pa takes a job on the railroad and move Ma, Laura, Mary, Carrie and Grace to the Dakota Territory where they spend the winter in a surveyor’s shanty.